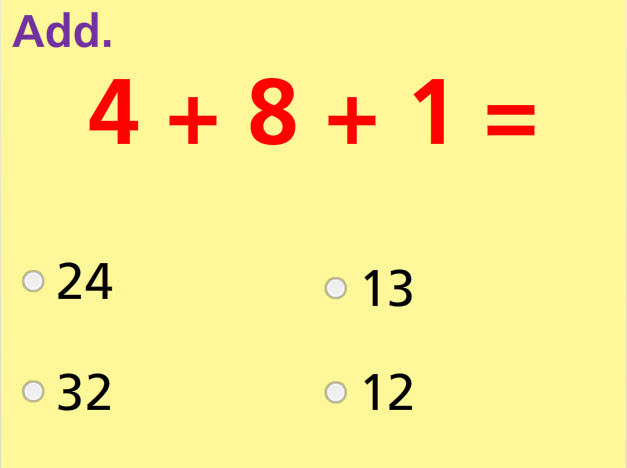 Take this online math test to strengthen your addition skills. It shows how well you can add three numbers. This test has ten problems: seven multiple choice and three drag-and-drop problems. The sums are up to 20. With this test, you can get immediate feedback. You can quickly know how much improvement you need. Return from this Add Three Numbers Math Test to the Elementary Math Tests , 1st Grade Math Tests webpage, or to Math Tests.